Le Monde newspaper in France says Mohammed Merah visited Israel before the attack in Toulouse. Israeli officials investigating. Mohammed Merah, the terrorist who murdered seven people, including a rabbi and three young children, and who was killed by French security forces in Toulouse, visited Israel several years ago, it was reported Thursday. Channel 10 News reported that the reason for Merah’s visit to Israel is not entirely clear, but it is believed he came to gather intelligence for his attack. The Channel 10 report was based on a comment made by an American officer serving in Afghanistan to the French newspaper Le Monde. The officer told the newspaper that Merah’s passport had been stamped with entry to and exit from Israel. However, the National Immigration Authority said on Thursday evening that an initial investigation found that Merah never visited Israel. Kol Yisrael radio reported that the National Immigration Authority said that the terrorist's name, as published in the media, was not found in the list of arrivals to Israel. The authority added that it is continuing to investigate the matter. Channel 10 noted that there are conflicting reports about whether Merah was identified as an Al-Qaeda activist before 2010, which is when he allegedly visited Israel. The report noted that if he was indeed suspected to be an Al-Qaeda terrorist, then Israeli procedure would have called for him to be interrogated at the airport and to undergo a thorough security check. It is unknown whether Merah was indeed interrogated or checked, the report said. The Israel Security Agency refused to comment on the issue and said that it was still being review reviewed. 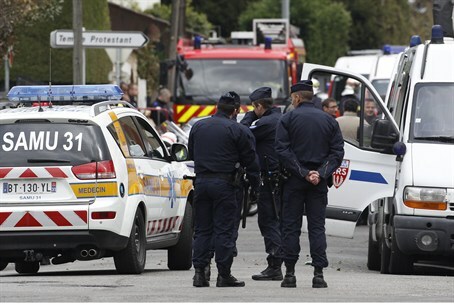 Merah, who was trapped in a Toulouse apartment after being surrounded by police, confessed to murdering a rabbi and three Jewish children in an attack Monday at the Otzar HaTorah Jewish day school in Toulouse, as well as three French Muslim paratroopers last week. He bragged to media and police that he had “brought France to its knees” and expressed no remorse, other than the regret that he had not had time to kill more. Merah reportedly died when he was shot in the head as he leapt from his window trying to escape the oncoming police.